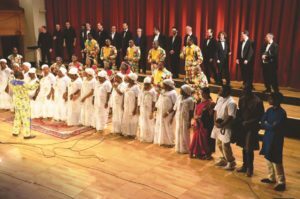 Chœur la Grace, a Congolese choir directed by Ambroise Kua-Nzambi Toko and composed largely of choir directors, has certainly claimed a presence these past ten years. 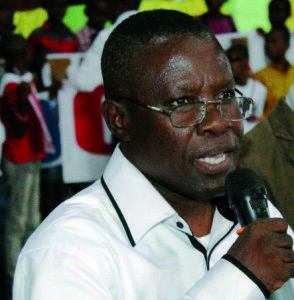 It is a member of the A Cœur Joie family, of the FIMC (since 2000), and was a co-founding member of the Congolese Choral Music Federation. After its stunning media success, without precedent in the Democratic Republic of Congo (DRC), due to its acclaimed audio and video album ‘Ngiele Ngiele’ which played on nearly all Kinshasa radio stations from 2001 to 2004, Chœur La Grace threw itself into conquering the choral world with force and determination. It quickly acquired international fame by participating in 25 international competitions. 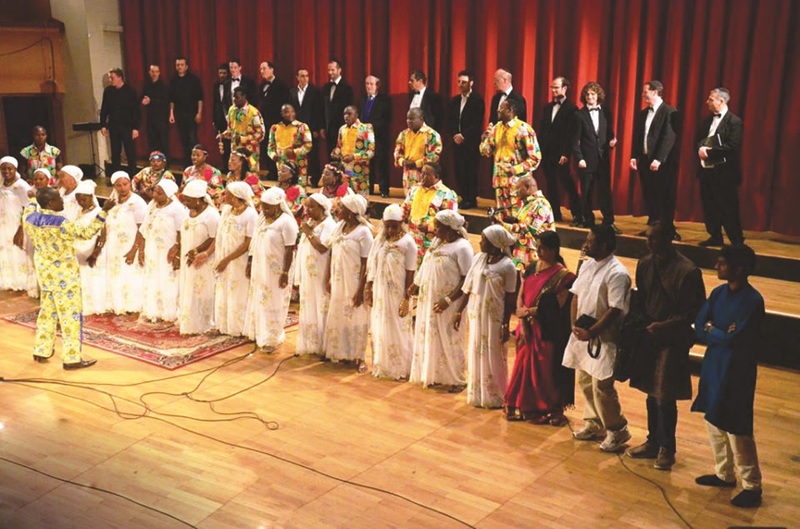 The group sings in 24 African languages and has a repertoire of four crafted choral programmes: Zimboka za Bantu (Cries of Mankind), Zingana (African wisdom through song), Chants of Black Africa, Ngoma ye nsakala (percussion) and the Humanity of Humans (created for the fourteenth summit of French-speaking countries in Kinshasa). Its 2013 tour was dedicated to the Return of Peace in the East of the DRC. It began May 9 with an eight-day residency in Ratingen (Germany) and from there to five neighbouring cities (Cologne, Düsseldorf, Moers, Mülheim, and finally Berlin, from May 17-23. In France, the group was welcomed in 25 villages and municipalities including Strasbourg, Nancy, Ouistreham, Caen, Saint-Etienne, Saint-Chamond, Saint-Martin la Plaine, Cluny, Lyon, Millau and Sylvanès. These valiant African choristers participated in a total of 78 performances at 11 local and international festivals and competitions, including forty-five public concerts in thirty-one cities. 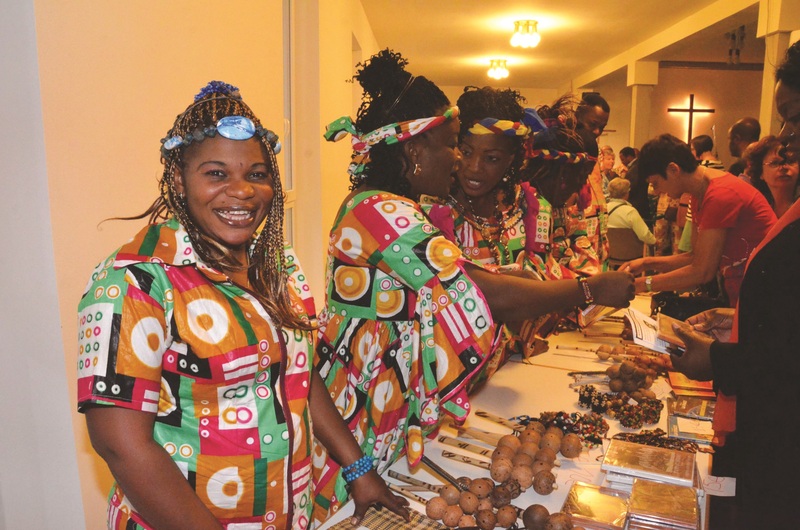 (These include the nineteenth Cameroon Challenge, participation in the Carnival of Cultures in Berlin, the ‘Sacred Days’ Festival in Strasbourg, the Night of Music and Culture at the Théâtre de Caen, the ‘Street Artists’ Festival, Nova’ciné in Saint-Chamond, the forty-fifth Anniversary Celebration of the Saint-Chamond MJC (Center for Youth and Culture), the tenth Anniversary Celebration of Blok Notes and the TouT’Le monde chante (Everybody Sing) Festival in Lyon, the Vienna Jazz Festival, and the Abbaye of Sylvanès’ Sacred and World Music Festival. The group has also organized workshops on singing, percussion and dance, as well as mini-concerts, in over twenty French and German schools, for children from kindergarten through high school age, and even music students. Five adult workshops on African choral music have been facilitated under the leadership of its director, Ambroise Kua-Nzambi. The choir has also performed during a number of worship services. While on tour, Chœur la Grace awarded certificates of honour and recognition to the people who organized their stays in various cities. Some of these people had organized more than one visit by the choir: Martin Hanke from Ratingen (2007-2013), Agnès Polet of Ouistreham (2007, 2009 and 2013), the Kiamvu-Le pont Association (2009, 2013), and Jacqueline Fabre of Saint-Chamond (2011 and 2013). The award recognized the no less important contribution made by these supporters to Chœur La Grace’s international reputation and. especially, to the promotion of African music. Other renowned artisans who will shortly receive their diplomas include Thierry Thiébaut, François Lupwishi Mbuyamba, Richards Augugliaro of Saint-Martin Vésubie (International Festival of Mountain Choirs) and Albert Tuzolana from Anderlecht. 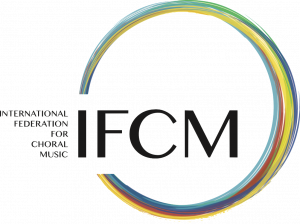 Thus the group can now count to its credit 214 international performances, plus 60 workshops (as either a participant or organizer), 25 international festivals and other encounters, of which the most prestigious are the World Choral Music Symposium (Kyoto 2005); the nineteenth Choralies of Vaison-la-Romaine (2007), Namur en Chœur (Belgium); and Musica Sacra International (Germany and Belgium 2012). Dates have already been confirmed for the next tour, which will take the choir to Germany, France, Belgium, Sweden, and Israel in the summer of 2015. On August 3, 2013, at an African choral awards ceremony organized in Lomé by ˝Africa Sings˝, Chœur La Grace alone won three of four trophies awarded: for best video clip, best performance on the international scene, and best African choir director of the year. Chœur La Grace would like to thank the Mayor’s Offices of Strasbourg, Saint-Chamond, Lournand, Cluny, Saint-Martin La Plaine, Roquefort, Sylvanès, and Villars; the president of A Cœur Joie, the choirs of the A Cœur Joie Lorraine family, the Church of Ratingen, the Raccib Association of Berlin, the Berlin Gospel Choir, the Kiamvu-Le pont Association, the Saint-Chamond Center for Youth and Culture, and all the choirs and host families who welcomed and housed its members. A big thank you as well to the Delegate General of Wallonia-Brussels for its support, to the German Embassy in the DRC, the Belgian Consulate in the DRC, the President of the Congolese Choral Music Federation, and all its partners who contributed in one way or another to the success of this historic tour, the memory of which will long remain etched in many minds.